The writer's files collection of the Ivan Doig Archive contains essays, book reviews, clippings, and other materials created or collected by Doig dealing with the process of writing in general. Included are submissions made to the Dictionary of Regional English and other pieces specifically mentioning the use of language and dialogue in fiction writing. 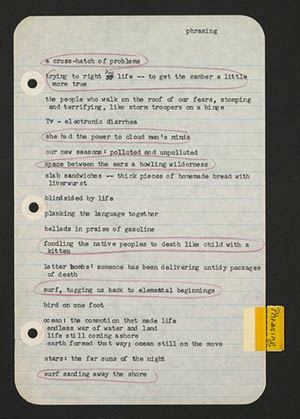 While some files may mention specific works, these items discuss writing in a general, rather than specific, sense. 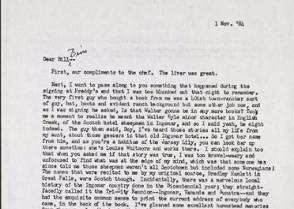 This folder contains letters written to Ivan Doig from book groups, students, reviewers, and more as well as Doig's responses back to many of the inquiries he received. 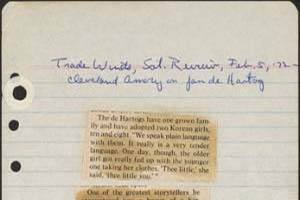 In a letter dated August 19, 1983, he offers advice to an aspiring writer, including insight into what he calls his "original notebook habits". In other letters, he explains how This House of Sky came to be named. This folder houses pages of anecdotes that Ivan Doig began collecting in the 1970's throughout the early 2000's. Some are typed by Doig while others were cut from various sources and taped on to another sheet of paper. One such anecdote was inspired during a visit to Glacier Park in June 1977. Ivan wrote: "on path to Hidden Lake at Logan Pass, a mother was trying to take photo of young son, who was tottering back and forth. In exasperation, she cried: Eugene, you're unfocusing! ".